I didn’t really understand Angelica until I went to Iceland, but since then, I can’t get enough of it! 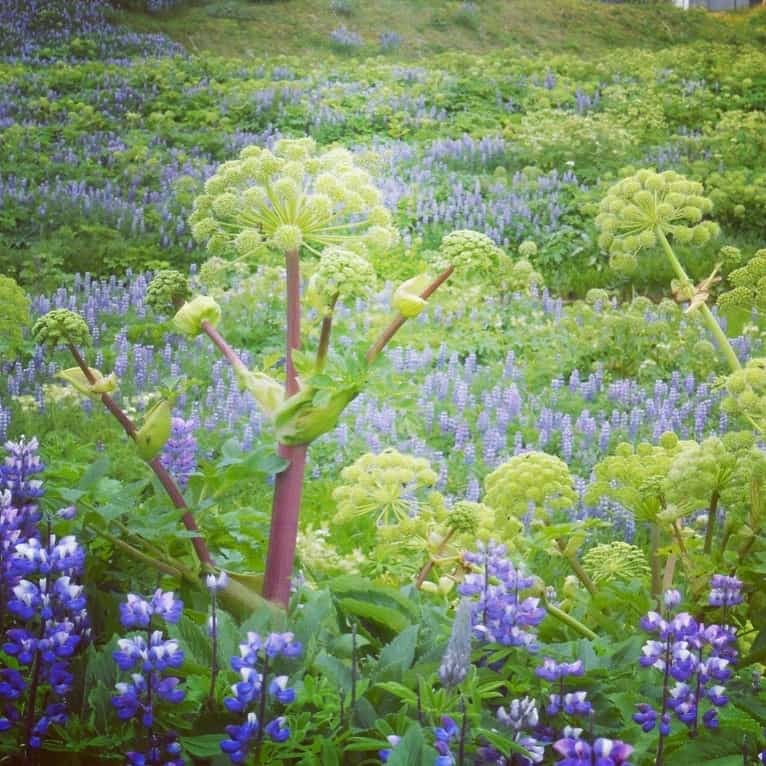 Angelica LOVES Iceland, and it grows as tall as me – or taller. It’s got a strong, tall stalk and huge flower head, with leafy arms that reach for the sky and the sun that never sets. Iceland is a place of extremes: it’s all day or all night. At any moment, a volcano could engulf the entire island, and everyone is very aware of that. The people are all work or all play – and I think the extremes of the climate and land encourage that. Seeing this amazing plant thriving in this extreme environment helped me really understand the plant better. Now, Angelica is a plant I work with literally every day. Angelica seeds are so delicious! When I first started working with Angelica, I didn’t even realize the seeds were a thing – but they’re so delicious. The flavor is lighter, more “effervescent” – it’s not actually effervescent, but it FEELS that way! Angelica seeds are warming, energizing, and super uplifting: exactly what I’m looking for when I’m feeling stressed. They’re diaphoretic too, and although usually when we use that term, we’re thinking about fevers, Angelica’s diaphoretic action really helps me to let go of things I’m trying too hard to control. Whether it’s my emotions about my to-do list, or worry over a particular aspect of business, or even if I’m stewing over a disagreement, the diaphoretic action helps me “sweat out” those emotions – just letting them dissipate out of my head. This is a very valuable feature! Angelica seeds make a delicious tea, but they’re also lovely as mead or liqueur. As you can see, these Angelica seeds came from Anna Rosa – we save our Icelandic Angelica seeds for special occasions! Roots would of course normally be decocted, but sometimes I love to infuse them. 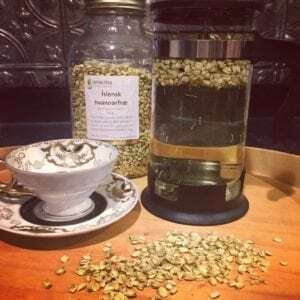 The flavor is a little lighter that way, and although you don’t get as much out of it, you can infuse them multiple times – the tea that keeps on giving! Either way, Angelica root is an important herb in my daily health. 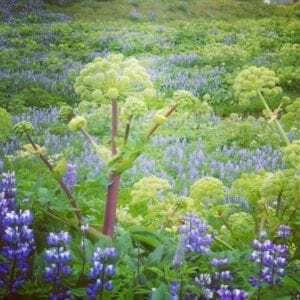 Remember that Angelica grows in extreme and harsh environments, where it’s all day or all night and volcanos might erupt any time – well, so do I – or at least, urban life feels that way sometimes! But Angelica can handle that with grace – and in fact, thrive! So frequently, I look at the environment that a plant grows in for clues to deeper understanding of how to work with a plant: plants adapt to their environments just like we do, and they produce substances that help them cope with stress in their environments just like we do. So if there’s a plant who excels in living in an extreme environment, it seems reasonable (and on the constituent level, it bears out) that it can help YOU survive in that extreme environment too! As far as I know, Angelica isn’t classified as an adaptogen, but in my opinion it definitely acts like one. I drink Angelica every day as part of my “notCoffee” decoction – usually a blend of Angelica, Ashwagandha, Codonopsis, Elecampane, Calamus, Reishi, Burdock, and decaf coffee, along with whatever else I have on hand! I drink a good pint-and-a-half of that in the morning with a little almond milk, and it’s delicious! 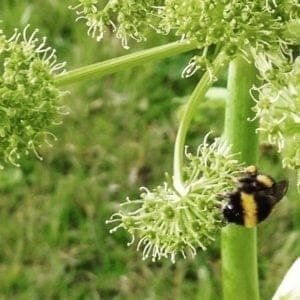 often in the evenings we’ll make a lovely light Angelica root infusion or Angelica seed infusion on a special occasion. Warming, circulatory stimulating, digestion-improving, and that extra something that gets you through the extremes of modern life! There are so many ways to appreciate Angelica. What’s yours? Want to learn more about herbs? Check out our Online Learning offerings – everything you need to root down and branch out with herbal education!